Diconstruction #13: Everywhere I Look, Plot Devices! Chris Marks returns this week with another installment of Diconstruction. This one focuses on that forgotten, overlooked, clicked-past element of the Diablo games… the plot. You know, that stuff in the books, or that the NPCs try to say before you click past to get on with your Hellforge rush. There’s some good stuff there, if you slow down a second and enjoy it. Here’s a quote from the column; click through to read the whole thing. Like the music of the games, the story is a part of the games that is almost integral, but often overlooked or ignored. If you pay attention to the lore and in-game information in either of these games, you can create for yourself a very immersive gameplay experience. Or you can kill Pindleskin fifteen thousand times. Really, it’s up to you. And that’s where the plot fails. Having an extremely intricate and well crafted plot only really matters if people pay attention to it, and once you’ve finished Diablo once you don’t really need to spend the time on plot any more. I suppose that’s one possible reason why some game makers are giving their games unskippable intros and cutscenes. Looking forward, I’m sure Diablo 3 will have an even deeper storyline and plot structure… which we will all ignore also. Everywhere I Look, Plot Devices! You know what most people forget about the Diablo games? That deep down inside, when you peel away all the senseless violence and blood curdling rage, they really have a heart. A good heart, a heart that beats strongly and then spews its blood all over everything as it’s slaughtered by all the players. All the players. Because that heart is the story and plot of the game, and most people don’t even remember that it exists. Think about it, when’s the last time you paid any attention to a cutscene, or talked to an NPC without demanding service? Are you even aware that Natalya is an Act 3 NPC, and not just the owner of some fancy items? There is some seriously rich depth to the Diablo Universe that many people just don’t know about, because once you’re deeply involved in the gameplay you just want to sever limbs and poke holes in things as quickly as possible. There’s actually a team of people responsible for creating the immersive worlds you use as a backdrop for all your pent up frustration. In the first Diablo, that duty fell to Dave Brevik, Erich Schaefer, Eric Sexton, Chris Metzen and Bill Roper. In the second, we owe the world to Chris Metzen, Stieg Hedlund, Matt Householder, Phil Shenk, Kurt Beaver and Bob Vieira. So now that we know who’s responsible, just what did they do, anyway? The story in the original Diablo begins long before you even install the game. Of the 75 pages of content in the game’s manual, 18 are lore, and a further 23 are written in a style designed to convey meaning within the game world rather than to outline how to do well in the game. That means 41 of 75 pages, more than half of the game manual, is about creating an immersive experience for you, the player. The game environment then continues to set the mood, being all eerie and spooky. I’ve already talked about the music and level design, so let’s move on to the real meat of the game’s story: interactions with NPCs and books placed on random pedestals for no known reason. There are 9 tomes scattered around the various levels in Diablo, and they’re meant to be read by the player to help flesh out the backstory, try to explain why you’re doing what you’re doing other than for your own sick amusement. Those ankle-biters sure do look funny when they twitch though, don’t they? They also offer a wide variety of people to interact with in town. Some are just there to talk to, like everyone’s beloved Farnham, town drunkard and purveyor of slurred words and random nonsense. I once heard a rumour that there was a game mod to let you play as Farnham, but I never saw any gameplay come from it, so it might have just been some drunk dude walking around with a bottle and slurring at people. Other NPCs serve a distinct purpose, that purpose being to take your money. Like Adria over there to the left, seller of potions, scrolls and books, among other things. Griswold originates here as the town blacksmith, for those who have played Diablo 2 but not Diablo 1. They had so much planned for backstory in this game that they didn’t even use all of it. They even had an entire character that didn’t get used (back that one up to hear a secret message from Diablo himself). Really, the lengths they went to in order to create a complete world are pretty impressive. Diablo 2 did a similar job with the manual, though not as much of it was devoted to mood and setting. Instead, rather than tell us the backstory, they show it to us as a series of cut scenes between the acts. Once again there are lots of different NPCs to interact with, and if you talk to them you can get a very detailed backstory on the world. After all, 5 times the NPCs means 5 times the banter for you to not actually pay attention to. What’s new in Diablo 2 is that if you play through from start to finish, the plot guides you rather than you guiding the plot. In the first game, you’d come across plot elements and handle them, never needing to stop for so much as a soda or change of underwear. In Diablo 2, there are a few times where you reach a point after which you cannot proceed until you settle the relevant plot point. For instance, you can’t rescue Cain unless you do things in a specific order, including talking with Akara, and do you really want to pay every time you talk to that old man? The place where this has the most impact on your gameplay is if you take the time to do all the quests. A lot of them are either caused by changes in the gameworld which you need to set right (i.e. Gidbinn), or they allow you to change some aspect of the game when you complete them (i.e. clearing the sewers). In some cases you can’t even continue until you’ve resolved a plot point, such as not being able to enter the Palace until you’ve shattered the Claw Viper altar. Diablo 2 also carries you through the story as it unfolds around you. You’re hot on the heels of Chicken Legs, dealing with the problems left behind by him as you cross the vast landscape with your big sword and practically endless stamina. 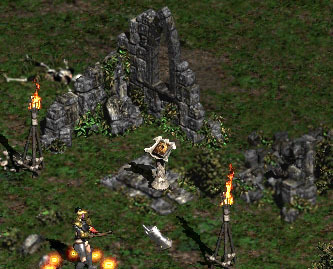 Tristram is burned to the ground to tie together a direct timeline between the two games, indicating clearly that they share a common plot. Diconstruction (Diablo Deconstruction) is written by Chris Marks. It examines differences between the two (soon to be three) Diablo games, as well as comparing them to other games, in a hopefully amusing style. Diconstruction is published on the first and third Tuesday of every month. Leave your comments below, or contact the author directly. ahh cool, I’d forgotten about that. so they just turned off those items from dropping in the 2 blizzcon builds.